My name is Inez A. Lasso. I was born in 1937 in the South Bronx of NYC, the youngest of four children. 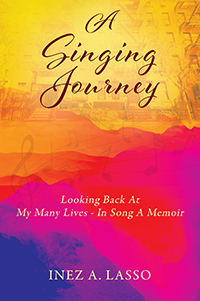 My mother, a Singing Contest Winner in her youth, filled our lives with music, singing with the radio as she cared for us. She turned the poverty of the Bronx into a happy home for us and singing and songwriting into a lifelong passion for me. I had the opportunity to join a religious organization, the "Young Christian Workers" as a Lay Missionary in Bogota, Colombia. I tell of the work I did to form new groups and of the young people I met who were enthusiastic about the movement and hoped to have a better life. I met my future husband in Colombia, and he came to New York where we got married on June 16, 1961. We lived in Jackson Heights, N.Y. and had 2 children, Elena and Diana. We then moved to Albuquerque, New Mexico as a better place to raise them. Our third daughter, Julie was born in Albuquerque. I always worked as a legal secretary while the girls were growing up but decided when I turned Forty that I wanted to have a job that made a difference in the world - I wanted to be a Lawyer who fought for the rights of women who felt powerless...but I had never been to college... So I enrolled in the University of Albuquerque and received my Bachelor of Business Administration; May 16, 1981, my Masters Certificate; from The Antioch School of Law for Equal Opportunity Law on February 15, 1983...and my Juris Doctor from the University of New Mexico on May 16, 1984. I divorced my first husband in 1985 after 22 years of marriage. I tell of my life as a Student and my life as an Attorney at Law and, in retirement, as an Administrative Hearing Officer, A/KA The Judge. I tell of my Second Life with New Husband after I moved to D.C. to work as a lawyer with the Dept. of Labor. He is a blind bluegrass musician and I was able to join him as a harmony singer in his band in weekend gigs. We were married for 12 years and remain friends. I wrote many songs during our marriage which we recorded together. Although I have travelled many roads from New York City to Colombia, S.A. to Albuquerque, N.M. to Nashville, TN to Napa, CA, my companion has always been a lifetime of songwriting. My life story has taken many unexpected turns and exciting challenges as well as marvelous blessings. The treasure I hold closest is the love of my three daughters who stand behind me through all my life choices. p. 28 "But, after six years at (Dept. of Labor), I was given another wonderful opportunity, this time to join the U.S. Department of Justice, by a fellow Hispanic attorney....turned out to be a dream job as legal Counsel to the Director of the Office for Victims of Crime..."My dream was enfolding in ways I could never have imagined....my own personal mission to do the Lord's work - it is from scripture Isaiah 61:1-3 ...then you will be called an: "oak of justice" planted by the Lord to show His glory"